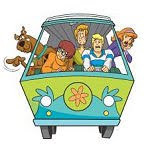 Haywood Homesteaders: Dreams of the Mystery Machine..... Can a modern car fit a Great Dane? Dreams of the Mystery Machine..... Can a modern car fit a Great Dane? Why in the world can't we build a vee-hick-el that can sip gas, last more than 5 years and oh yes- be large enough to fit a Great Dane? As the dog pack and the 4 Runner both age, we are thinking ahead to a reliable, durable ride and let me tell you folks- DE-PRESSING, though you can get great deals on Toyotas right now... we have looked and researched and looked some more and what a hard pill to swallow- spending a lot of money on something that will ultimately be coated in mud and cat prints on the outside and dog hair and slobber on the inside. Then there is "The Hobby"
An automotive vice so evil and potentially damaging that purchasing a new car is out of the question. You imagine off roading adventures or crazed hyper-milers- no folks- it is much, much more sinister. PETA members stop reading now. Let me paint a picture for you. Anyone who has ever been to our home knows that our twin kitties - Cletus and Roscoe just love to crawl on and in any car to investigate. When we arrive home on cool days the kitties waste no time crawling on the hood to nap on the warm engine. This has left hair, dirt and the occasional bloody animal part on the hood. we get good laughs but it is hell on a paint job. I have contemplated tacking some carpet on the hood like I have seen my bear huntin' buddies do so their dawgs can find purchase. So if anyone has my dream vehickel out there - let me know! Oh lordy Karl is going to build an Ornithopter!